EK-Supremacy Classic RGB is a high-end water block CPU water block for modern Intel processors. It features a simple, minimalistic design while maintaining the class-leading performance. The water block comes with a pre-installed 4-pin 12V RGB LED strip. EK-Supremacy Classic RGB is a high-end, quality CPU water block for modern Intel processors. It features a classic, market-proven design that will perfectly fit the needs of core enthusiasts and demanding users as well! The EK-Supremacy Classic RGB water block uses a simplified revision of the award-winning EK-Supremacy CPU water block cooling engine, further tweaked for performance and optimal coolant flow! Low hydraulic flow restriction enables this product to be used in setups using weaker water pumps or lower pump speeds for added silent operation, while still achieving top performance! 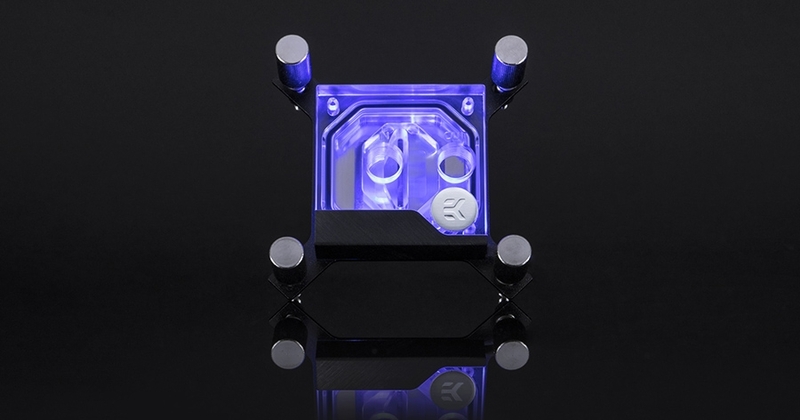 The water block also comes with a simple, straightforward RGB lightning implementation which connects to a standard 4-pin 12V RGB header.